The first map in the Visscher-Jansson Series to identify New York, New Jersey, and Albany. Novi Belgii quod nunc Novi Jorck vocatur, Novae Qe. Angliae & Partis Virginiae Accuratissima et Novissima Delineatio. A very attractive example of Arnoldus Montanus and John Ogilby's 1671 important map of New York, Virginia, New Jersey, and New England - the first in the Jansson-Visscher series to use British nomenclature. Part of the Jansson-Visscher Series (maps derived from the Visscher Map of 1655), this map covers from the St. Lawrence to the mouth of the Chesapeake Bay, and from the Chesapeake Bay estuaries, past New Jersey , Long Island, and Cape Cod, as far east as the Penobscot River. 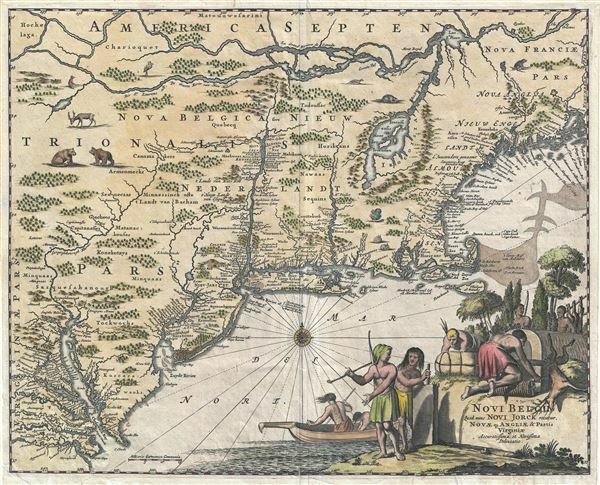 The map offers considerable detail throughout, including an updated nomenclature reflecting the 1667 Treaty of Breda, in which the Dutch surrendered New York to the British in favor of the East Indian Island of Run, then the only known source for nutmeg. The map identifies Nova Albania (Albany), Nieu-Jarsey (New Jersey), Nieu Jorck (New York, shown with fortifications), and Iamaica (Jamaica, Queens). This is notably the first map in the Jansson-Visscher series in which these names appear. Montanus and Ogilby's map also features many of the flaws common to the series. Lake Champlain, named here Irocoisia, appears far to the east of its actual location. The St. Lawrence runs too far south, and there is no suggestion of the Great Lakes. The North Fork of long island is weekly mapped. In a nod to Willem Blaeu's 1635 Nova Belgica the lands are decorated with vignette illustrations of various fauna indigenous to the Americas. These include two bear, a dear, a fox, several beaver, a crane, a muskrat, two rabbits, and a turkey. The lower right quadrant features an elaborate cartouche illustrating American Indians engaged with various tasks from skinning animals, to fishing, to bundling furs, and firing clay. There is some minor confusion over the use of the term 'Novi Belgii' next to the term 'Nieuw Nederlandt' in most maps from the Jansson-Visscher series. This is a simple linguistic doubling. The term appears in both Latin and Dutch. There was no Latin for the Dutch term Niew Netherland (Nieuw Nederlandt), so Novi Belgii was used instead. The map above represents the first state of this map, engraved by John Ogilby and published in Arnoldus Montanus's 1671 Die Nieuwe en Onbekende Weereld. There were two subsequent states. The second state was issued by Van der Aa and appeared c. 1729. A third state, issued in 1761 (note the curious inversion, first edition 1671, last edition 1761), was prepared in Amsterdam by Covens and Mortier. Arnoldus Montanus (c. 1625 - 1683) was a Dutch scholar, publisher, schoolmaster and author active in Amsterdam during the latter half of the 17th century. Montanus is a Latinized form of van den Berg or van Bergen. He studied theology at Leiden University and was ordained a minister in 1653. In 1667 he became headmaster of the Latin School of Schoonhoven, where he died in 1683. Most of Montanus's work was published in conjunction with engraver Jacob van Meurs and focused on travel narratives to Asia and the Americas. His most famous book, De Nieuwe en Onbekende Weereld, contains what is arguably the first view of New York City, the New Amsterdam. His other works offer up some of the earliest known descriptions of China and Japan. Much of Montanus' work was translated and published in English by John Ogilby. Montanus, A., Die Nieuwe en Onbekende Weereld, (London) 1671. Very good. A few minor closed verso repairs bottom quadrants. Burden, P., The Mapping of North America II, no. 411, State 1. McCorkle, B. B, New England in Early Printed Maps 1513 - 1800, no. 671.1. Library of Congress, G3709.3 1670 .O3. New York Public Library, Map Division, b15328013. JCB Map Collection WLCL 2:161. OCLC 49825579.